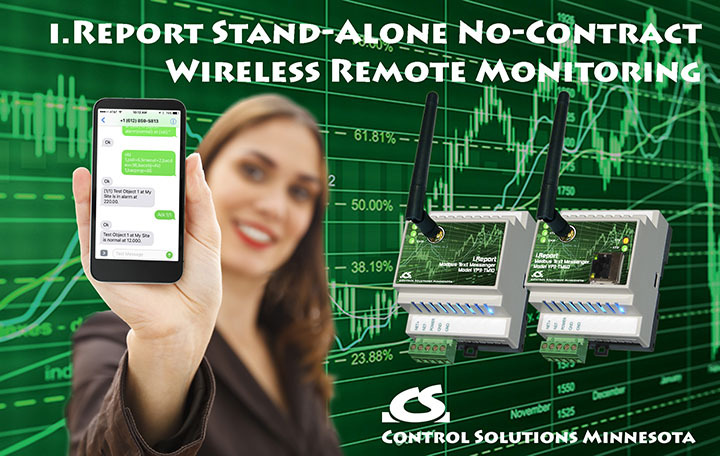 i.Report Stand-Alone No-Contract remote monitoring is the ideal do-it-yourself remote monitoring system. You get simple yet powerful remote monitoring without the need for a monitoring service. No contract. Built-in alarm monitoring watches your equipment and sends text messages directly to your mobile phone alerting you to problems. 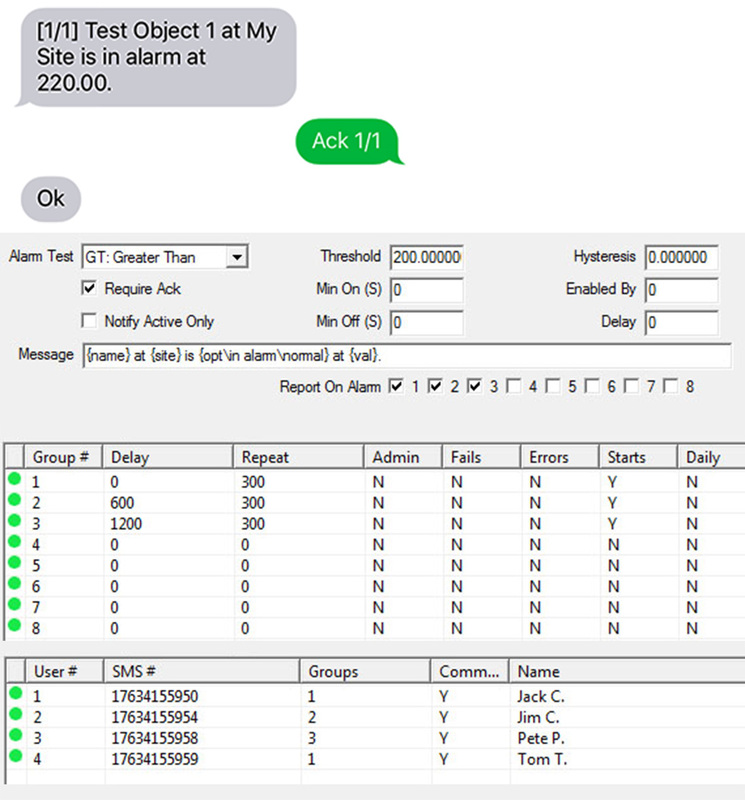 The i.Report Text Messenger is a self-contained remote monitoring and alarm notification system that monitors data points in one or more Modbus or BACnet devices and alerts you and others via SMS when an event has been detected that somebody should know about. The i.Report Text Messenger offers simple yet powerful remote monitoring without the need for a monitoring service - no contract required. You decide what events somebody should know about, and who should know about them. If the event is important, you can require the alarm message recipient to acknowledge the notification. You also have the option of escalating the notification to additional users if the first user (or group of users) did not respond by acknowledging the alarm within the time limit you set. A single i.Report can monitor up to 100 data points from a single device or from multiple devices on the network. An event can be a level exceeding a threshold high or low, a change in state, change in value, or deviation from a setpoint. The parameters that decide what constitutes an active alarm are set up with an easy to use template. A notification is sent when the alarm transitions to “active”, and again when the alarm transitions to “inactive”. If acknowledgement is required but not received within the time you allowed, the active alarm notification is repeated, possibly including additional users each time if you set it up that way. The notification message consists of whatever text you provided, optionally including template variables. These “variables” are replaced with dynamic data, such as present level, at the time the message is sent to users’ mobile phones. Don't want to wait for a notification? No problem, you can also query any data point at any time via text message. The i.Report Modbus Text Messenger can be Modbus master or slave. As master, it will poll other Modbus slaves, querying the registers you have selected and evaluating register content against alarm criteria. As slave, you can have your PLC or SCADA system write data to the i.Report for alarm evaluation. Modbus RTU also includes “Sniffer Mode” which means you can monitor Modbus data without any reprogramming of the Modbus devices being monitored. As long as there is traffic on the network between a master and one or more slaves, you can monitor it and receive notifications when selected registers match riteria you set. The i.Report is also useful for “non-network” monitoring applications. There are many industrial sensors available with Modbus capability. 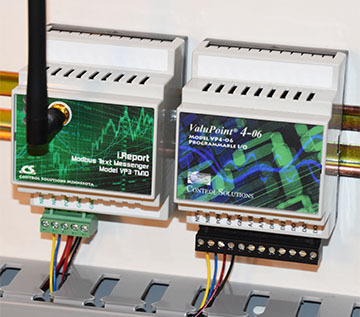 Control Solutions offers three different models of ValuPoint Programmable I/O which may be used to interface multiple sensors, and even remotely controllable actuators. The i.Report BACnet Text Messenger can be a BACnet client or server. As a client, it will read properties from objects in other BACnet devices and retain copies of that data for evaluation against alarm criteria. As a server, the i.Report will contain a collection of Analog Value and/or Binary Value objects which other BACnet devices may write data to. 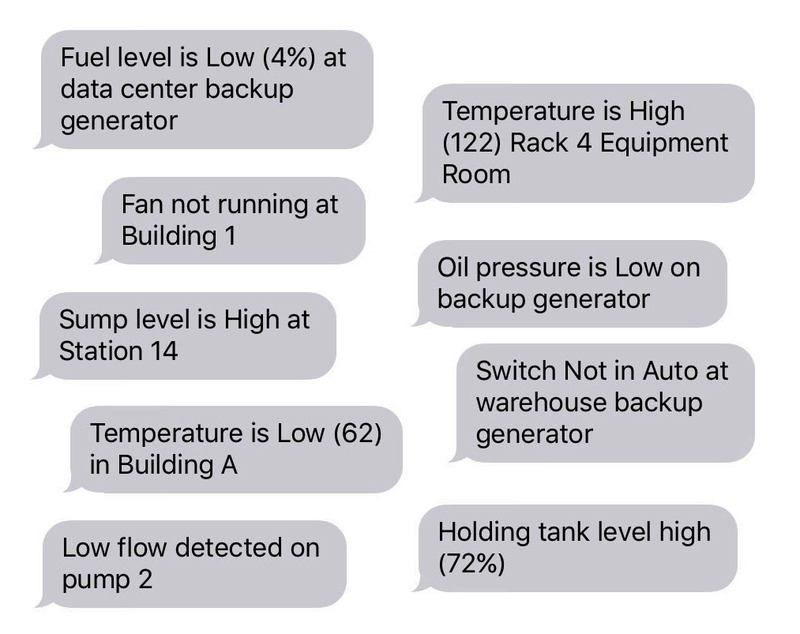 The i.Report Text Messenger can be used in multiple ways in Building Automation Systems. You can provide alarm monitoring and notification regarding specific equipment such as chillers, compressors, pumps, air handlers, etc., and do this monitoring without reprogramming anything. This makes i.Report a useful diagnostic tool that can be quickly added without impacting existing BAS programming. If you don't have the Modbus device but do have things to monitor, like sensors, switch contacts, and the like, Control Solutions' ValuPoint I/O devices make a perfect match for the i.Report. You can do everything needed to configure the VP3-TM entirely via SMS. But you will find initial setup is streamlined with the use of the free configuration tool software provided by Control Solutions. The VP3-TM configuration tool provides easy templates to fill in for configuring data points and their respective alarms, as well as entering users in the phone book. The VP3-TM is shipped to US locations with your choice of AT&T or Verizon compatible SIM pre-installed. You activate the SIM at your own convenience with low-cost no-contract service. Non-US destinations will require a user provided SIM compatible with local carriers.